Do your kids love to doodle? Draw? Daydream? Do they ever feel like nobody understands them? 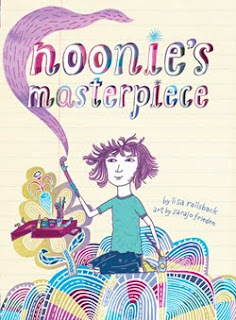 Noonie's Masterpiece is a book for kids who love escaping into their drawings and daydreams, but still want a best friend and a teacher who understands them. This short novel will appeal to budding artists who know how hard it is to take risks, share your artwork and make friends. Ten year old Noonie Norton is an artist just waiting to be discovered. She’s sure of it. But no one else understands her. Not her Aunt Sylvia or Uncle Ralph, whom she lives with. Not her math teacher Mrs. Tusk or Principal Maloney. Perhaps the only people who can glimpse Noonie’s creative potential are her art teacher Ms. Lilly and her best friend Reno. Noonie’s mother died five years ago, and now Noonie’s father is in faraway China examining fossilized wild yak bones. But Noonie feels a strong bond with her artistic mother, and has started her Purple Phase. The review copy was kindly provided by Chronicle Books. If you make a purchase on Amazon using the links here, a small portion will go to Great Kid Books. Thank you for your support. If you are looking for books to share with your children during Passover, I would highly recommend two books, one for younger readers and another for older readers. These are books that will enrich children's lives and understanding of this special holiday, whether their families celebrate Passover or not. Every spring as Passover arrives, Miriam and her brother help prepare the house for this special celebration. This year, Mama has a surprise for Miriam: a beautiful glass cup and the story of the prophet she was named for. "Every year we tell the story of how God freed our ancestors from slavery. Well, one of these ancestors was a brave and clever girl named Miriam." Miriam was Moses's older sister who placed him in the Nile for the Pharoah's daughter to find. Many years later, as Moses was leading the Jewish people out of Egypt, Miriam helped inspire the people with song and dance. In her honor, God created Miriam's Well, which provided clear water for the Israelites in the desert. This picture book does a wonderful job of retelling the story of the Israelites' exodus, and the role of Moses and Miriam. It is clearly retold, and the illustrations are full of movement, color and emotion. This book was created to give people of all ages a fuller, richer understanding of what Passover means. This book should be read before the Seder, and used during the Seder together with the Haggadah, to answer questions that the participants have. That is what the Seder is really about: asking questions, getting answers, expanding our knowledge, and understanding. Kimmel explores the history and lore of Passover; some sections explain the different parts of the Haggada, while others present stories of different Jewish people celebrating Passover throughout history. I particularly liked how the book was organized using the Seder as the central organization, with different sections you can dip into. Parents will enjoy reading this to understand more details behind the holidays, and older children will enjoy reading different folklore and explanations. As the Booklist review says, Kimmel's "writing shines as he ably explains the holiday, its customs, and rituals in language simple enough for children yet layered to keep the attention of teens and adults." The illustrations are especially rich and detailed, including medieval Haggadahs reproduced in full color, a 15th century B.C.E. Egyptian mural of slaves making bricks and mortar, and artifacts such as a 19th-century matzoh cover from India. 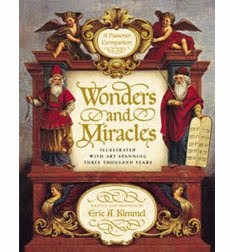 Wonders and Miracles received the Sidney Taylor Honor Award for Older Readers in 2004. Both of these books came from my local public library. If you make a purchase using the Amazon links on this page, a small percentage will go to Great Kid Books. Thank you for your support. Losing a tooth is a BIG deal. Just ask any little kid in kindergarten or 1st grade - they'll be able to tell you who's lost a tooth recently. It's a rite of passage, a sign that they are growing up. All of a sudden, something solid that's been in their mouth as long as they can remember, suddenly becomes wiggly and then FALLS OUT! Rene Colato Lainez has written a wonderful story blending the traditions of the Tooth Fairy, who visits children throughout North America, and El Raton Perez, who visits children in Spain and throughout Latin America. It's full of humor and imagination, and is a perfect way to celebrate blending traditions of families from many backgrounds. When Miguelito looses his tooth, he hides it under his pillow. 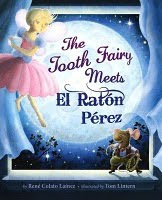 Far away, the Tooth Fairy sees the signal that a tooth is ready for her, but so does El Raton Perez. When both arrive at Miguelito's bedside, they can't believe that there's competition for this pearly white tooth. The fairy says, "Here is my tooth!," and the mouse replies, "¡Aquí está, mi diente!" The Tooth Fairy and El Raton Perez struggle and argue until the tooth is flung up high into Miguelito's bookshelf. Now neither of them will get the tooth, unless they figure a way to work together. This has been my kindergartner and 3rd grader's favorite picture book this year. They love the way Rene Colato Lainez blends the two cultural traditions. They love the humor, as these two creatures argue just like little kids do. They love the artwork, the way Tom Lintern brings alive the night time of their imaginations with shadows and lighting. The humor in the illustrations matches the text perfectly. As the School Library Journal review says, "Young readers may not consciously recognize this tale as a metaphor for growing up in two cultures, but the story does model how to successfully negotiate a bicultural life by celebrating both aspects of Miguelito's Mexican-American heritage." This story is so creative and clever that children soak in the reality of a child embracing both sides of his heritage without feeling that it is instructive. Rene Colato Lainez was born in El Salvador, and moved to the United States as a teenager. He has taught at Fernangeles Elementary School in Sun Valley, CA for seventeen years. He tells a very funny story of hearing a teacher run in fright when a child told her about a little mouse crawling under his pillow to get a tooth he left there. Check out the Latin Baby Book Club to read the whole story. The review copy was kindly sent by the publisher. If you purchase a copy through Amazon, a small percentage will go toward Great Kid Books. Thank you for your support. Historical fiction brings me into a time period I can only imagine, and makes me feel what it would be like to live in a completely different place and time. Gary Paulsen, best known for Hatchet (one of my all-time favorite books), does just this in his new novel Woods Runner , bringing readers into the American Revolutionary War as a young frontier boy. It is a gripping story which I loved listening to as an audiobook. Thirteen year old Samuel lives in Western Pennsylvania, in a small settlement far away from any large city. He spends his days in the forest, hunting for food for his family. In order to survive, Samuel has learned how to track game, sense changes and follow trails in the woods. Samuel’s parents moved to the frontier to escape the pressures and complications of life in the city. Soon after Samuel hears news of the Revolutionary War, the brutal realities of the conflict are brought right to his home. British soldiers and Iroquois attack his settlement, burning all the homes, slaughtering most of the inhabitants and taking Samuel's parents away as prisoners. Samuel follows the British, tracking them silently through the forest, determined to find a way to rescue his parents. Along the way, Samuel sees more devestation caused by the war, particularly brutalities caused by the Hessian mercenaries. But he also finds allies: men and women who help him, feed him, protect him. Samuel learns that he must go all the way to New York City, to find his parents. Paulsen’s writing carries emotional weight, as you connect with Samuel and feel his isolation, his pain, his anger. But Paulsen intersperses each chapter with a short nonfiction section explaining such things as weapons, war orphans, Hessians and other issues related to the story line. These nonfiction sections are short, usually one or two paragraphs, and without illustrations. While some readers might skip them, I found them interesting on audio, a short break from the intense story, and always related to the story. I was hoping Paulsen would provide sources for further reading, but am hooked enough on the story to want to seek out more information on my own. This was a great story to listen to as an audiobook. Danny Campbell creates a deep, rough voice that feels like he's telling Samuel’s story sitting around a campfire. As Audiofile says, “Campbell skillfully employs pace and projection to build suspense and convey Paulsen's page-turning action. Campbell uses a deeper, flatter tone to differentiate brief paragraphs of background information appended to each chapter.” Because of the violence and emotional impact of this story, I would not recommend it for younger readers. It is appropriate perhaps for 5th graders, or more likely for 6th grade and above. A wonderful article about Gary Paulsen by Jim Trelease is here. 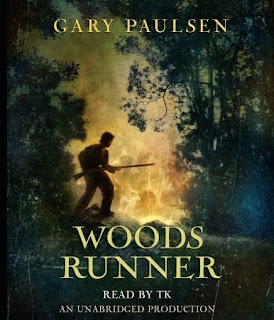 Gary Paulsen will be visiting bookstores through the US in April to talk about Woods Runner. See his schedule here. This audiobook was kindly sent by the publisher. If you make a purchase using the Amazon links on this site, a small percentage will go to Great Kid Books (at no cost to you). Thank you for your support. The Diary of a Wimpy Kid is one of the most popular books at our school library, and it's no surprise that many kids are excited about the upcoming movie opening March 19th. The kids are lining up to borrow a new book: The Wimpy Kid Movie Diary . This movie-tie in goes beyond the simple repackaging, and is a fresh look at what it's like to make a movie. Starting with "A Wimp Is Born", Kinney tells the story of how this story and movie came to be. You'll see photographs, script pages, storyboard sketches, costume designs, and original art by Jeff Kinney. Instead of following Greg's life, like the other books do, this new book follows the movie making process. Kids will like dipping into different sections, or reading it straight through. The Wimpy Kid Movie Diary is the perfect companion for fans of this series. I had a lot of fun reading sample script pages, seeing how movies are really written. As Kinney writes, "Cartooning is the art of boiling something down to its simplest parts, but in a movie, a director is working on a much bigger canvas and needs to 'fill out the frame' with lots of detail." (p. 98). It was fun to see how different scenes were developed, and others were added. * Casting roles of Greg's friends. Kids really liked seeing sketches from the cartoons in the book, next to pictures of the actors who were cast for different roles. * Comparing comics from the book to scenes from the movie: Kids liked seeing how simple sketches in the book are flushed out in photos from the movie. * Special effects: Kids had fun seeing how visual effects were added to a silicone piece of cheese to make it look like the stinkiest piece of cheese possible. * Fake newspaper report: Kids had fun seeing mock-ups of the Westmore Middle School newspaper showing Patty wrestling (and trouncing) Greg. This book will be enjoyed by kids who like the Wimpy Kid series, and especially by kids who are interested in making movies. A definite hit! 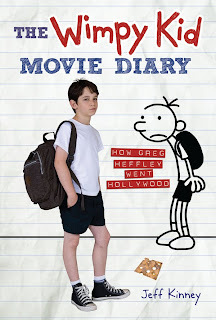 Wimpy Kid Movie Diary is available on Amazon and bookstores near you. Please note that if you make a purchase on Amazon using these links, a small percentage will go toward Great Kid Books. Thank you for your support. The review copy of this book was sent by the publisher. So many kids are drawn to graphic novels and comic books - they love how visually stimulating they are, they love the laughs and the drama. They love reading books with fewer words but all the ideas! So it warms my heart when I read a graphic novel or comic strip that has wonderful characters, a rich story, and all the details I'd hope for in a novel. 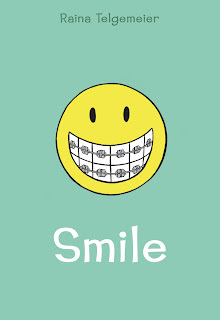 Smile , by Raina Telgemeier, is a brilliant story that speaks to tweens on the brink of adolescence. Raina just wants to be a normal sixth grader - to fit in, to figure out the right clothes to wear, to have fun with her friends. But one night after Girl Scouts she trips and falls flat on her face, severely injuring her two front teeth. What follows is a long and frustrating journey with braces, dental surgery, embarrassing headgear, and even a retainer with fake teeth attached. Definitely not the recipe for fitting in! On top of the dental drama, Raina goes through middle school and starts high school, dealing with friends who turn out to be not so friendly, boys and crushes, and a major earthquake. This coming-of-age true story is sure to resonate with tweens and teens who are trying to figure things out for themselves. Author/illustrator Raina Telgemeier does a wonderful job of capturing the emotions of a young tween/teenager - the joy, the angst, the pain, the drama. Yes, this is a real story, based on all the dental drama that Raina really went through. When I brought home the ARC (advanced readers copy), my 5th grader took it to her room and read it straight through. That night, she asked me to read it aloud to her (a treat! ), and we did - staying up way past her bedtime to finish it! We just got our "real" copy in the mail, with full color and a glittery front, and my tween escaped with it again! 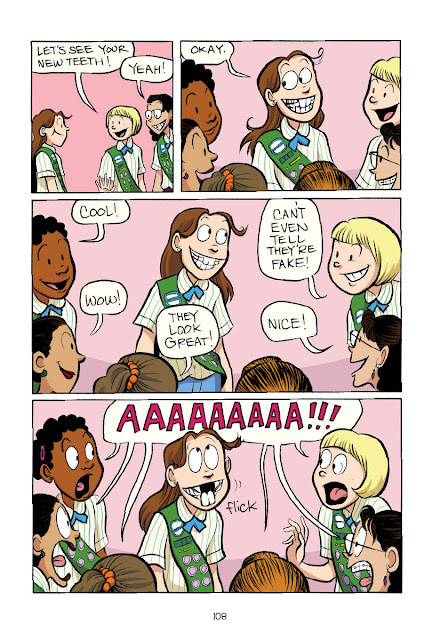 Raina Telgemeier might be known to you as the illustrator of the Babysitter's Club comics . She grew up in the San Francisco area, but made her way to New York City when she was 22 to attend the School of Visual Arts as an Illustration and Cartooning student. She has a lovely style, full of action and emotions, and yet not too dense so the story shines through. Smile went on sale last month. It's going to be my go-to present for girls turning 11 and 12! The ARC came from the ACL librarian group. We purchased the final copy from Amazon. If you make a purchase on Amazon using these links, a small percentage will go to Great Kid Books. Thank you for your support. Any book that has a poem called “The Autobiography of Murray the Fart” is going to make kids laugh and want to read more. 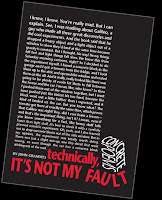 If you're looking for a book to broaden your view of what counts as poetry, come check out John Grandit's wonderfully, creative concrete poems. These poems are all told from the point of view of Robert, an 11 year old boy who is clever but bored. “Technically, it’s not Robert’s fault that a concrete block fell on the car or that his sister’s homework got blown to smithereens. Really, he doesn’t try to cause trouble. He’s just an ordinary kid who likes pizza and sports and computer games.” Grandits creates visually engaging, hilarious concrete poems – shape poems that combine words, ideas, type and art to make pictures. But it’s Grandits’ humor and understanding of real kids that will make readers laugh about the most ordinary things. This accessible, goofy collection shows how you can bend and twist language to create meaning in new ways. Take a look at John Grandit's website for a new concrete poem each month.You'll get sense of his creativity and humor.If you have a big sister in your family, you'll also enjoy Grandit's collection for young teens: Blue Lipstick . It's a definite favorite with our middle school students. Both are available in paperback and would make a fun addition to a home or school collection. Review copies came from our school collection. Please note if you make a purchase from Amazon using the links here, a small percentage goes to Great Kid Books (at no cost to you). This will be used to purchase more books to review. Thank you for your support.